One of the most frequent criticisms lobbed at the Zelda series is that it’s always just the same game, over and over again - that people who love it were indoctrinated as children and are incapable of seeing it for what it is. I have heard this not just from people on the Internet, who are always ready with their reductive criticisms, but from friends, family, a couple of lovers (related: heated arguments about Zelda in bed are deeply unsexy). It always makes me ball my fists and breathe deeply. As much as I love Zelda, it is difficult to argue that its story is exactly profound. 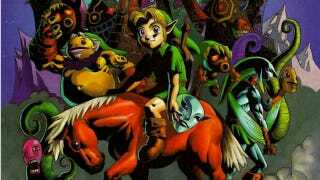 Majora’s Mask is the exception; it is something I can enthuse about without fear of hyperbole. Like Wind Waker, it is a bastion of technical and creative bravery in a series that sometimes doesn’t get enough credit for its innovations. We’ve never had anything like it since, perhaps because Nintendo is not as keen to let its teams go off-piste with its pillar franchises as it was in the N64 era. Its return on 3DS came at exactly the right time.